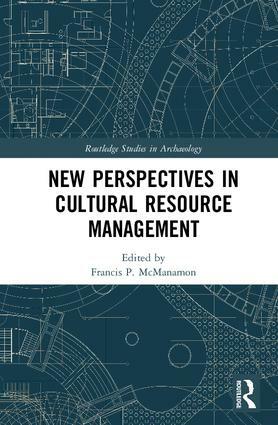 New Perspectives in Cultural Resource Management describes the historic developments, current challenges, and future opportunities presented by contemporary Cultural Resource Management (CRM). CRM is a substantial aspect of archaeology, history, historical architecture, historical preservation, and public policy in the US and other countries. Chapter authors are innovators and leaders in the development and contemporary practice of CRM. Collectively they have conducted thousands of investigations and managed programs at local, state, tribal, and national levels. The chapters provide perspectives on the methods, policies, and procedures of historical and contemporary CRM. Recommendations are provided on current practices likely to be effective in the coming decades. 2. The National Register of Historic Places: Honor Roll to Planning Process, Jerry L. Rogers. 3. Glen Canyon Salvage to Dolores CRM: Big Changes from Big Projects, William Lipe. 4. CRM and the Development of Ethical Standards, Don Fowler. 5. Transportation Archaeology: 40 Years of Contributions, Issues, and Challenges, Owen Lindauer. 6. All the Gold on the Map, Sarah H. Schlanger and Signa Larralde. 7. Travels among the States: Noting Accomplishments and Identifying Challenges for the 21st Century, Paul A. Robinson. 8. Zuni and 40 Years of CRM: A Perspective from On and Off the Reservation, Cindy Dongoske, Kurt Dongoske, and TJ Ferguson. 9. The Business of CRM: Achieving Sustainability and Sustaining Professionalism, Terry Majewski. 10. Recording Pull-Tabs and Barbie Dolls: Have Our CRM Methods Become Artifacts? Heidi Roberts. 11. Using CRM Data for "Big Picture" Research, David Anderson. 12. CRM and Archaeological Collections Management Strategies: The U. S. Army Corps of Engineers Approach, Michael K. Trimble and Andrea Farmer. 13. Business Challenges for the 21st Century: The Next 40 Years of Private Heritage Management, Christopher D. Dore. 14. Heritage Conservation: Cultural Resource Management Results for Public Planning, Preservation, Research, and Outreach, Linda Mayro and William Doelle. 15. If a Genie Offered Me Three Wishes…, Lynne Sebastian. 16. Perspectives on Leadership and CRM Programs for the 21st Century, Francis P. McManamon and Jerry L. Rogers. Frank McManamon is the Executive Director of the Center for Digital Antiquity, School of Human Evolution and Social Change at Arizona State University. Before joining Digital Antiquity in 2009, he was the Chief Archeologist of the National Park Service and Departmental Consulting Archeologist for the Department of the Interior in Washington, DC. Dr. McManamon has been involved in the development of policy, regulations, and guidance for CRM. He has special interests and expertise in CRM, the long-term access to and preservation of archaeological data, CRM laws and regulations, and public outreach and education.